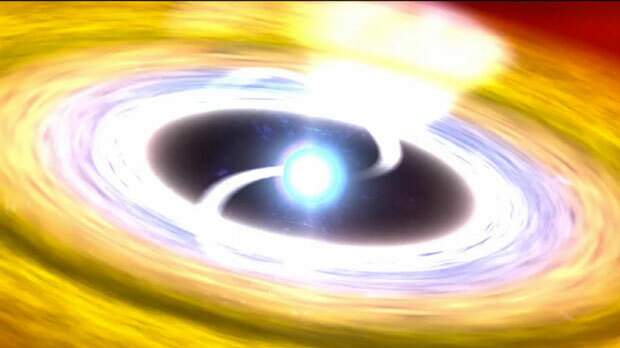 An artist's rendering shows gas falling onto a supermassive black hole, creating a quasar. If this were a Sherlock Holmes story, its title would surely be "The Case of the Disappearing Quasar." In this case, however, the mystery wasn&apos;t solved by an aging Victorian-era detective, but by a young American astronomer at Penn State University named Jessie Runnoe and her colleagues. They study quasars, some of the brightest objects in the universe. Quasars aren&apos;t stars. "They&apos;re the result of gas and material falling into a supermassive black hole," Runnoe says. The gas heats up as it falls in, causing the region to glow brightly. The case began early last year. In January 2015, they decided to measure the spectrum of a quasar with the prosaic name J1011+5442. Its spectrum had been measured in 2003, and they decided it was time to look again. "And when we went back to look, all of the spectral signatures we associate with a quasar were gone," she says. It seemed the quasar just disappeared. The first thing they did was make sure they were looking at the right patch of sky. Once they were convinced they were looking in the right place, they started trying to figure out what had happened. "One possibility," Runnoe says, "is that something just passed between us, that there was a cloud of dust or something in the galaxy and it got between us and the quasar and we can&apos;t see it anymore." She says astronomers have seen dust clouds pass in front of bright objects before, but the object&apos;s spectrum usually gives a clue when that happens. In this case — nothing. Besides, another telescope caught a brief glimpse of the quasar in 2009, and it still was shining brightly. There wouldn&apos;t be enough time between then and 2015 for a large enough dust cloud to move into place. No, what Runnoe and her colleagues think happened is the quasar just ran out of gas. Literally. All the nearby gas fell into the black hole, and there wasn&apos;t enough left to produce the brilliance quasars are known for. The video shows how the spectral signature of the quasar changes as the gas finishes falling into the black hole. And as crazy as it sounds, the end came quickly for J1011+5442. It went from shining brightly to virtually nothing in a celestial blink of an eye, maybe just a couple of years. "This thing is tens of millions of times the mass of the sun," says Runnoe. "So for it to do anything on time scales that we can experience is kinda nuts." Runnoe says it&apos;s a reminder that even though the night sky appears static, things are actually happening all the time. So there are probably more quasars winking off out there. "And if we can find more and we can study them, we can find out how gas falls into a black hole, and stuff like that," she says. That will add another small piece to the most mysterious puzzle of all: how the universe works.